I should definitively sit down and learn how this is done... I suppose you found the offending bytes with the debugger? There wouldn't be some kind of tutorial around that gets one started with this? Great I was able to fix. I have 15 years experience in coding, so I know where to look, and how to work with a debugger. The technique I used was to debug the original and the manipulated corrupt rom with trace once, first logs making anything but trigger the bugged event (pulling the lever). Then I disabled the hook and set it again, triggering the event. The result is two logs for each rom. I discard the first log (where superfluid actions are logged like walking and such). So the second log contains only the action of interest. 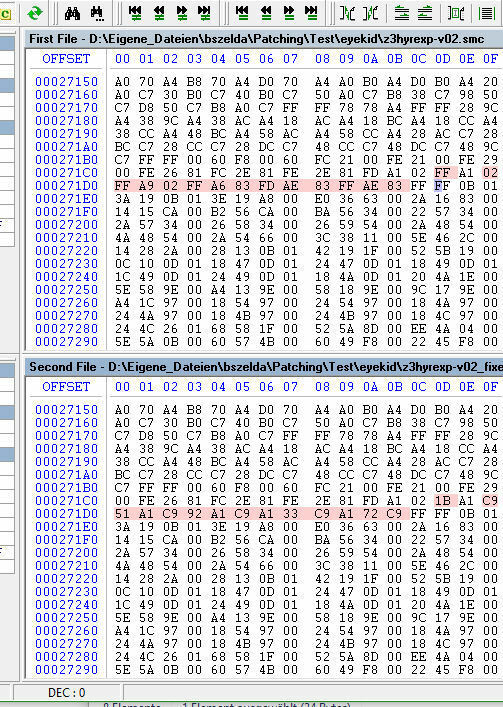 Comparing the original with the corrupt log (without the superfluid actions discarded it was only 62 kb long) revealed a change in the X-register. So I searched where this change occurs and restored these bytes (given addresses above). ... and here we go. As said, I have a lot practical experience, but for somebody without much asm experience finding such stuff is out of reach. Conn wrote: [...] for somebody without much asm experience finding such stuff is out of reach. I understand what you explain in theory. I know how to use a debugger (e.g., gdb) for "regular" code. The methodology is obviously very similar. But the assembler code is simply unreadable for me... So, probably I should learn asm. I thought the further problem was on a different address, since the code might use a pointer and jump there. I wonder if there is a pointer to around 0271C0 in the section around 00CBAD. Hi, any chance to get this working with the Master Quest hack? zeldaistehbest wrote: Hi, any chance to get this working with the Master Quest hack? EDIT: I gave it a quick try. Applying the Master Quest patch first, and the Hyrule Explorer patch second seems to work fine. Hopefully it works. I'll try it out... Now I wonder if you can combine Master Quest, Redux and Hyrule Explorer. zeldaistehbest wrote: Now I wonder if you can combine Master Quest, Redux and Hyrule Explorer. In principle, very good idea! But Master Quest comes only as .bps / .ups, which the patch checker cannot handle... In principle, one could make an .ips from the patched ROM and then check, though. Sure. This could very well not work... Hence, I said that I only gave it a quick try and the resulting ROM still loaded fine. That doesn't mean that it isn't broken at a later stage... However, someone interested in combining the different patches is the perfect candidate for testing the result - as they are obviously interested in it anyway. In general, if the ROM structure was changed during the modifications two patches will most likely not work together as they assume specific parts of the ROM at wrong addresses. I'd assume that if Hyrule Magic was used for both patches, the ROM will have basically the same structure. In that case, the patches should work more or less as intended. In summary, what I meant to say is: I only tried if the ROM is not completely broken when combining these patches. In that cases it might be worth to "test by playing" whether it works. MQ+Redux broke right away, which means it will be more involved to get that working.